This little Circus Elephant Lovie was inspired by Dumbo and is based on my pattern for Grace the Crochet Elephant Comfort Blanket. 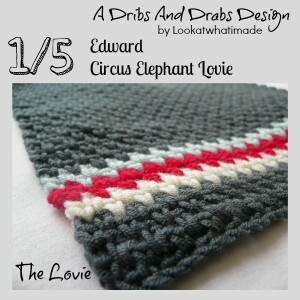 This is my first Dribs and Drabs Design. 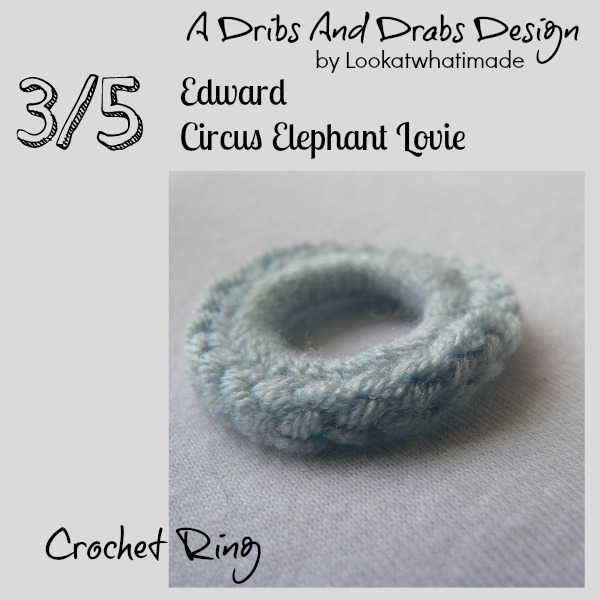 What is a dribs and drabs design? 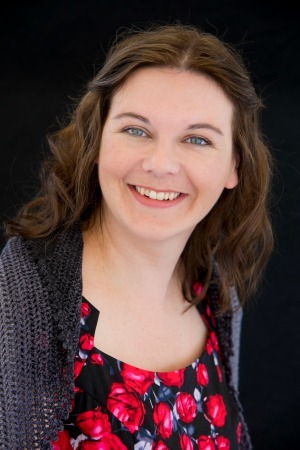 Well…some of us are a bit more scatterbrained and disorganized than others! 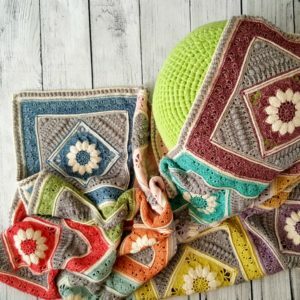 I have always wanted to do a crochet-along, but organizing something like that is just not my forte. 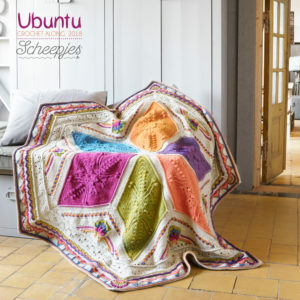 So a dribs and drabs design is LIKE a crochet-along, but more chaotic. Over the past week I have posted some pretty random patterns. But there was method in the madness! 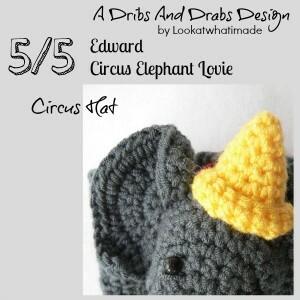 Each of the last 5 patterns are actually part of Edward, my Circus Lovie. 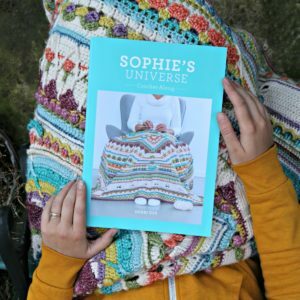 In this post I will tell you which parts you will need to make and how to assemble the lovie once you’ve got all your parts made. So…brace yourself for a treasure hunt! 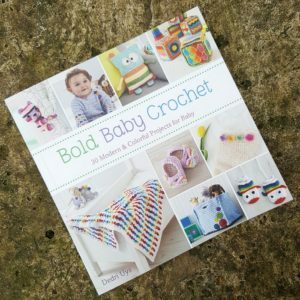 I use US Crochet Terminology. You can find a conversion chart here. Please note that the colour suggestions, either here or on the actual patterns, are just that: suggestions. Feel free to use any colour under the sun! 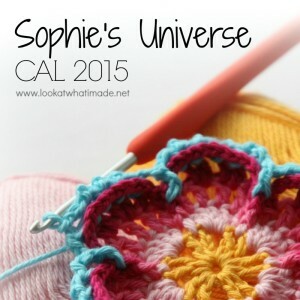 You can find the pattern for the Linen Stitch Lovie here. 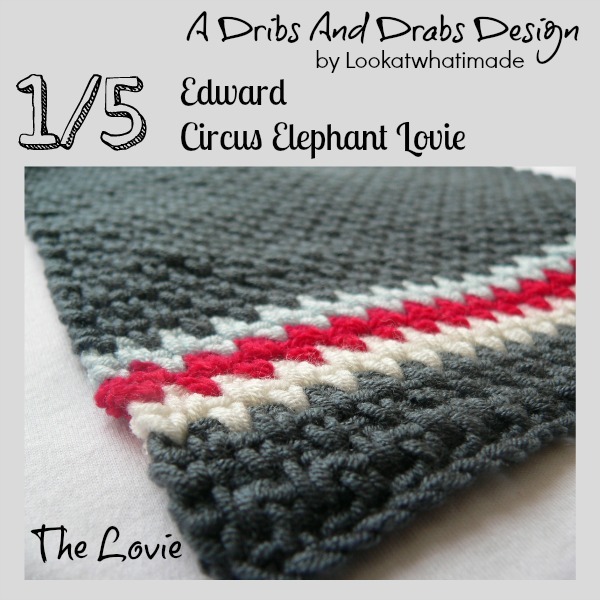 I have provided a tutorial for making the linen stitch, followed by the actual pattern. 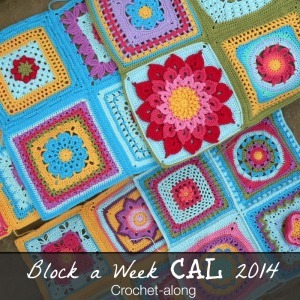 Using the hook and yarn specified in the pattern, your lovie will be just shy of 20 cm square (8″). 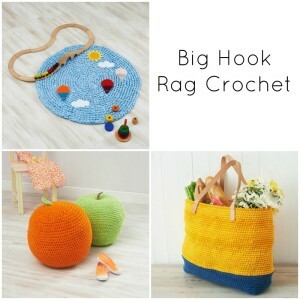 Feel free to use thicker yarn and a larger hook if you want to. 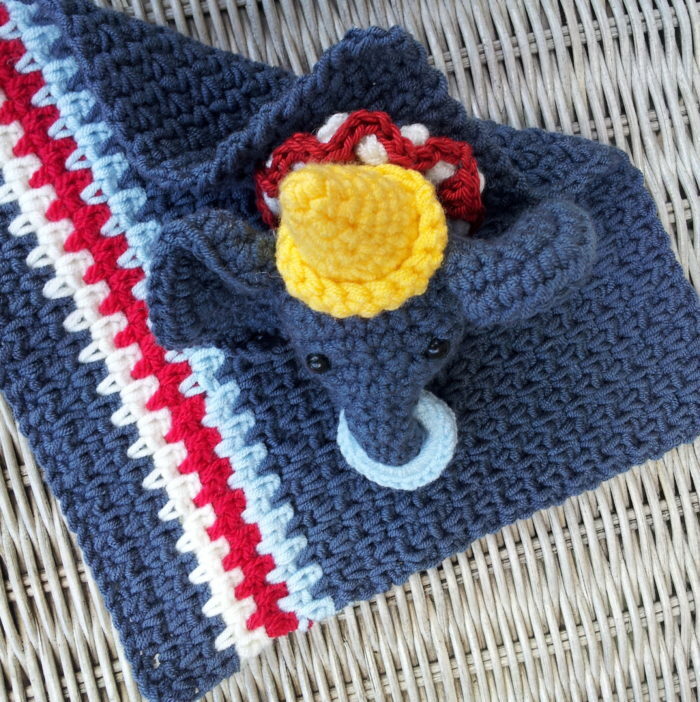 Just bear in mind that the hook used for the comfort blanket should be larger than the one you use for the rest of the parts, otherwise it will be WAY out of proportion. Make one Ruffled Neck Collar, following my pattern for the Ruffled Crochet Flower. 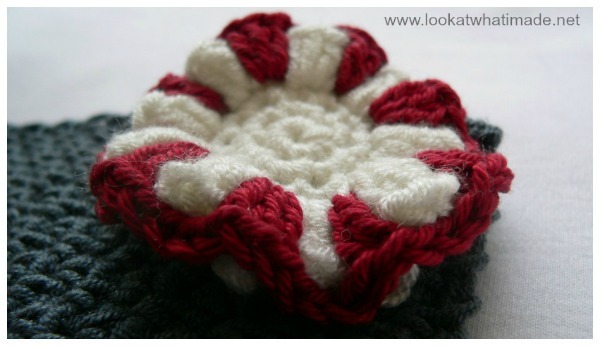 Make one Crochet Ring, following the pattern for the Tiny Crochet Wreath. 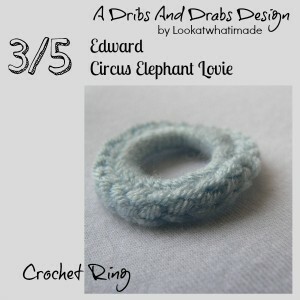 Use light blue yarn for the ring. 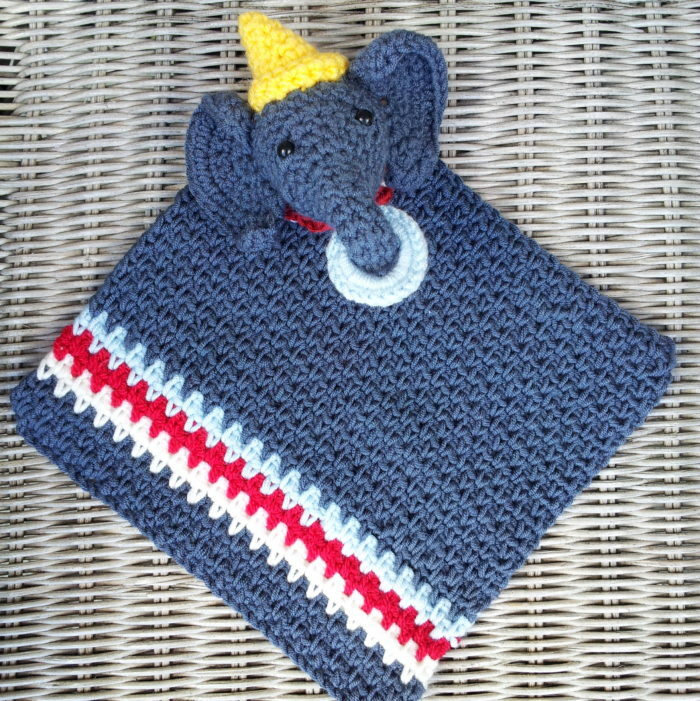 You will need to make one Elephant Head using the instructions found in the pattern for Grace the Crochet Elephant Comfort Blanket. But just wait one second before you do! Before you make the head you will need to decide if you want to use the large dumbo-style ears or the smaller girly ears. If you prefer the girly ears, go ahead and make the ears and head exactly as instructed in the above pattern. 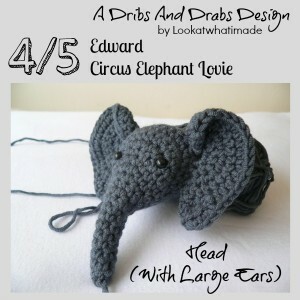 If, however, you want to use the large ears, you will need to make 2 x Large Elephant Ears following this pattern. THEN make the head using the pattern for Grace. 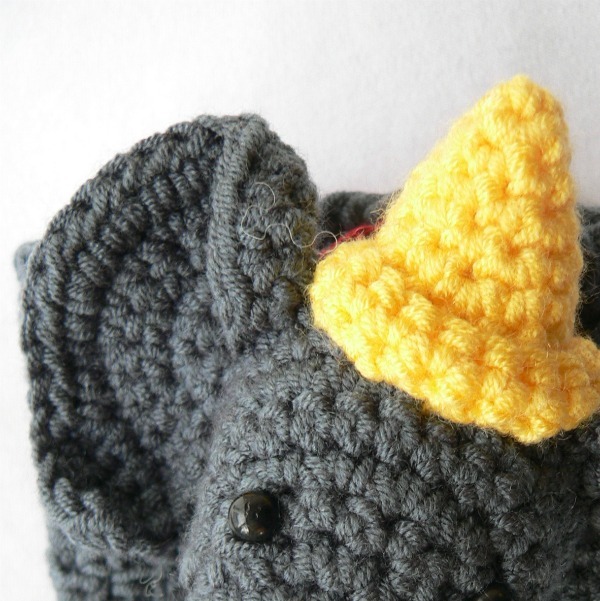 When you get to the bit that tells you to attach the ears, follow the instructions that go along with the Large Elephant Ears. 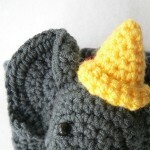 Make one Amigurumi Hat in yellow following this pattern. Don’t attach the hat just yet. We’ll do that right at the end. 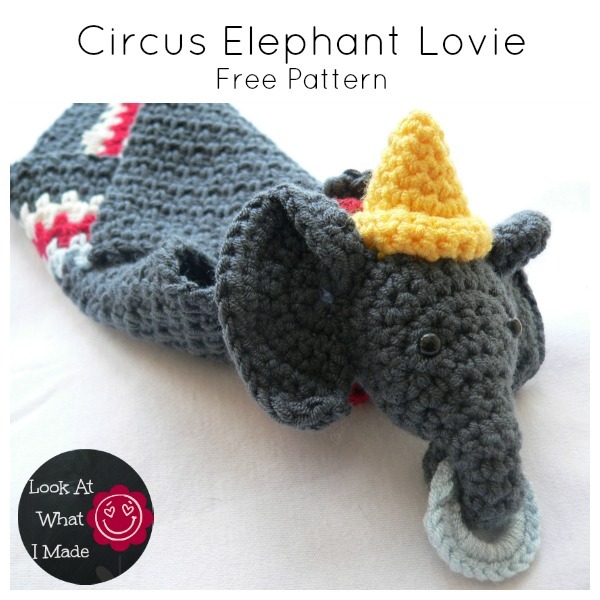 Now that you have all your parts made – check them…you should have 5 bits – it is time to assemble the Circus Elephant Lovie. 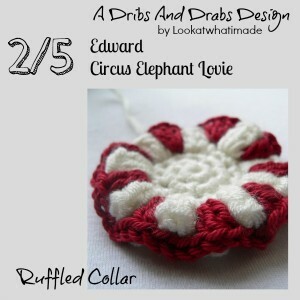 Take your lovie and place the ruffled collar in the top left-hand corner (or wherever). The top left-hand corner is the one on the left, farthest away from the coloured stripes… in case you were wondering. 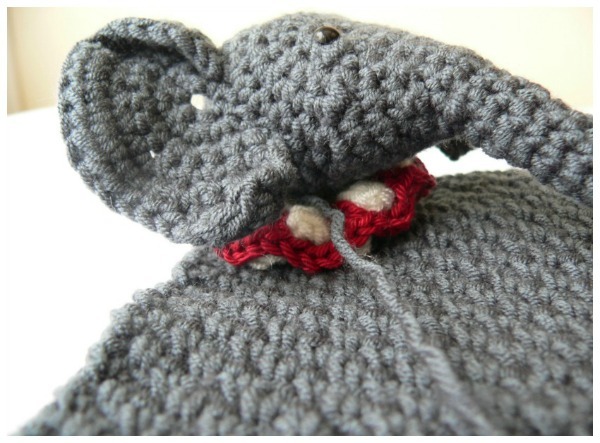 Make sure your elephant head is nicely stuffed and then place it on top of the collar. The opening of the head should fit nicely into the center of the ruffled collar. 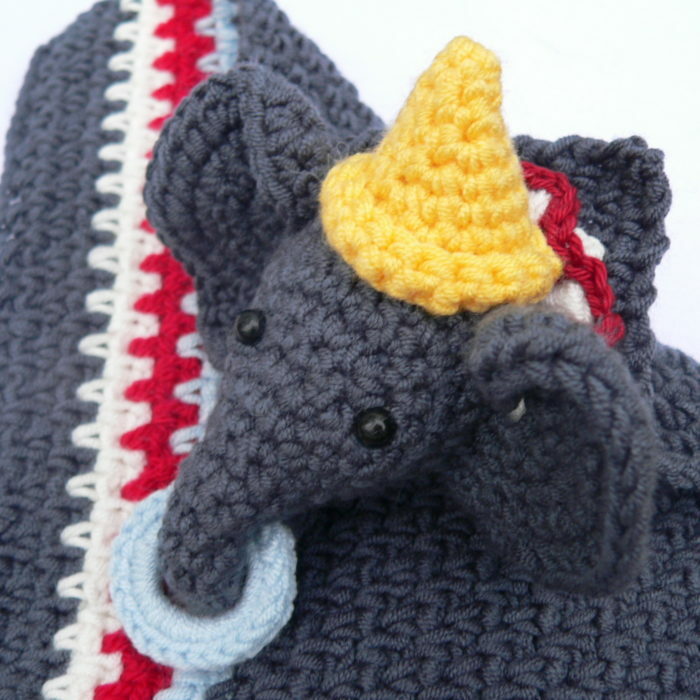 Using the long final tail of yarn from the head, sew the head AND the ruffled collar onto the blanket by sewing through all three layers in a circle. It doesn’t much matter how you choose to do it. I found running stitches to be the easiest. Poke the needle through one of the stitches of the head and through to the back of the blanket, then poke it back through all three layers, catching the next st of the head, and so on and so forth. Making your head in the same colour as the blanket is beneficial because you won’t be able to see the stitches on the back of the blanket. If you have made your head in a different colour you will need to be more prudent about how you sew the head and the collar onto the blanket. I suggest just catching the top layer of the blanket so that you don’t end up with ugly stitches on the back. 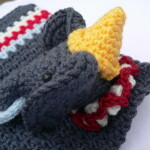 Once you have attached the head, sew the hat onto the head using the instructions provided in the pattern for the Amigurumi Hat. 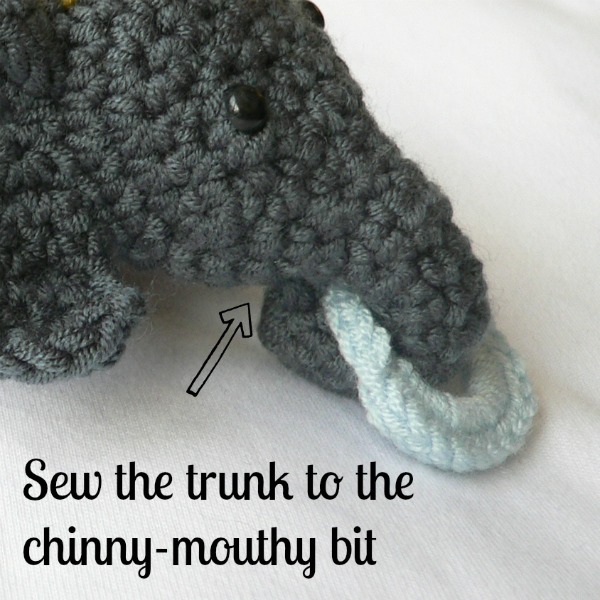 Finally thread the crochet ring over the trunk and then secure the trunk to the bottom of the elephant’s face using the long initial tail of yarn from the trunk. 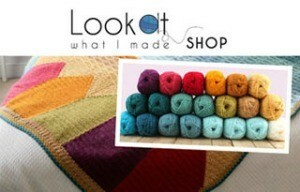 When you are done, work away any wayward tails of yarn and marvel at your creative awesomeness! If you have any questions, please do not hesitate to contact me. 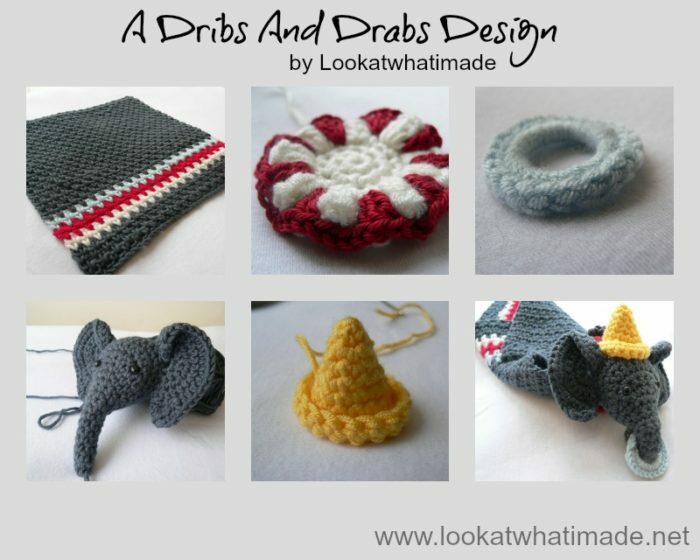 You can leave a comment on this page, OR you can join my Dribs and Drabs Design Facebook Group and ask me there. Pretty please (with a cherry on top!) share some photos if you do decide to make young Edward here. I love nothing better than seeing people’s interpretations of my patterns. Thank you for stopping by and I hope that you enjoy making your Circus Elephant Lovie! Thank You. For the lovie. My daughter loves elephants, but I have t o do one change to the pattern, the trunk has to be turned up. Means good luck.. Thank You much. I can’t wait to try this — soooo cute! Thank you. This little elephant is adorable! I have two young grandbabies I believe would love this. Thanks for sharing. 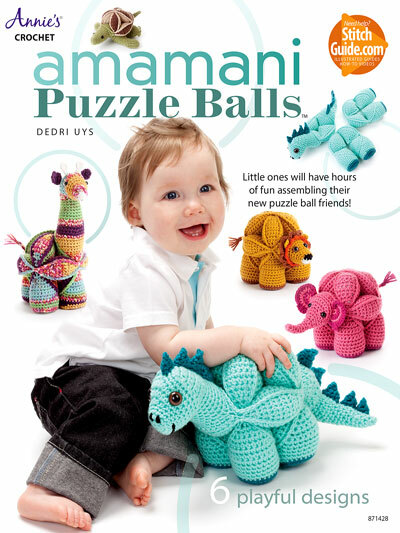 So cute, I can’t wait to get started making this for my grandkids. 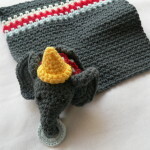 My Gran who’s turning 99 next month loves elephants so I’ll be making 1 for her too. Hi, I’m finishing up one of these for the baby, and my 2.5 yo noticed the collar looks like a peppermint. Totally cute to make a bunch of those slightly smaller and put into a bowl. Cheers!! Lol, Julie. When I first posted photos on Facebook, that is exactly what the girls on there said. Just a pleasure, Amy. Glad you like it.